* What About Swift? * by Marc Zeedar Apple has introduced a new programming language. How does it compare to Xojo? Marc takes a _quick_ first look at Swift. * Inside ServerSocket * by Christian Schmitz Christian explains how to use the ServerSocket control in your own apps, to let you process your own network connections. * Writing OS X Apps for Game Center * by Tom Baumgartner Apple's Game Center provides developers with an API for connecting gamers. 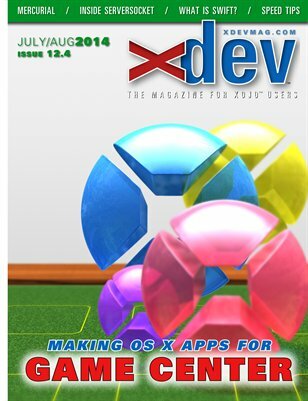 However, creating a Game Center app with Xojo requires extensive steps. Never fear: Tom's figured it out and will show you how to get started. * Mercurial and Xojo * by Craig Boyd Mercurial is a power version control system. Craig likes its command-line interface and shows how to use it with your Xojo projects. Plus columns on OOP, database design, optimization tricks, creating usable code, Regex lookarounds, and much more.